I don't do beets. I detest them so much that I actually put eating them on my 30 Before 30 list. I mean, a 30-year old woman shouldn't hate a food item; that's just silly. It took me eight months to find a beet recipe that didn't scare me too much and I'd like to thank the copious amounts of heavy cream and feta cheese in this dish for calming my fears. 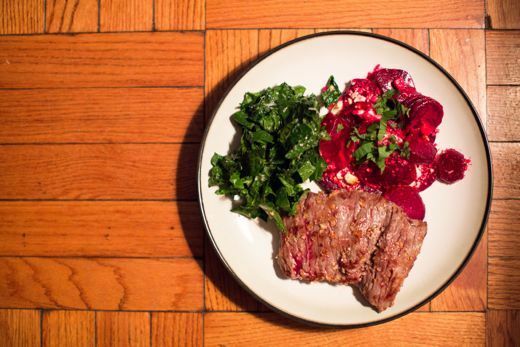 And guys, my heavy cream and feta-flavored beets were actually okay. Actually, they were more than okay. I liked them so much that I willingly ordered a salad with beets in it a week later...and I didn't gag. I may be a beet-liever. First of all, you need to get your beets from a non-bootleg farmer's market. I'm serious, don't make the same mistake I did. I bought my beets "fresh" in my neighborhood, which I thought was the best approach since I was scared about this whole process anyway. If you don't believe that there's such thing as a bootleg farmer's market, just take a look at my beet greens. Yeah. Moving on. 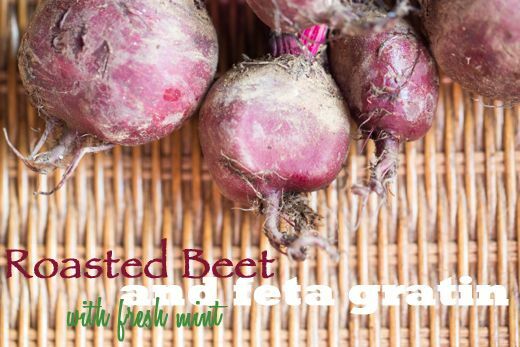 Preheat your oven to 400 degrees, dress your beets with salt and pepper, add some water, cover and go (in case you're new to my recipes and are getting punchy about my how-to, the "for real" instructions are at the end of the blog post)! 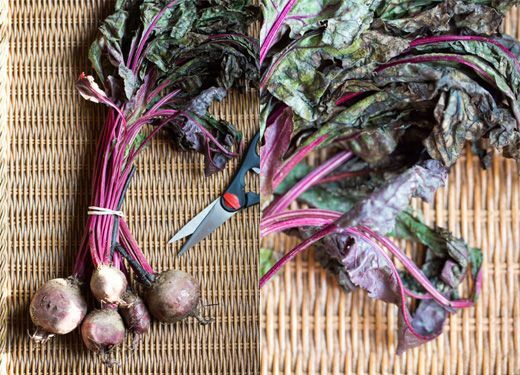 After about 50 minutes, remove your stuff and let your beets cool. Then have your husband peel and cut them. Why should you have your husband do that part? Look at all that pink. Just imagine what beets make the inside of your stomach look. Eww. I can't believe I actually, voluntarily ate this stuff. Now comes the creamy goodness...I may have added more garlic, cheese and cream than the recipe actually called for. I was really scared about the being able to taste the beets. Masking the earthy flavor with three of my favorite things seemed like a logical solution. After the cream is done, strain it over top of the beets. And add more cheese because, why not?! Back in the oven for another 20-ish minutes until everything starts looking all brown and beautiful. Let it cool. Then plate and eat. Not too bad for beets. 1. Preheat oven to 400°F. 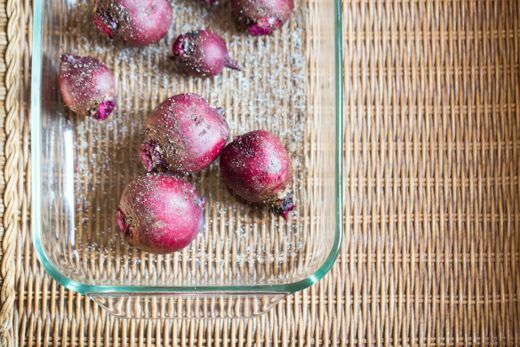 Place beets in small baking dish. Add enough water to reach depth of 1/4 inch. Sprinkle lightly with salt and pepper. Cover tightly with foil. Bake until beets are tender, about 50 minutes. Uncover carefully (steam will be released) and cool. Peel beets; cut into 1/4-inch-thick slices. DO AHEAD Can be made 2 days ahead. Cover and chill. 2. Preheat oven to 425°F. Bring cream, mint sprigs, and garlic to boil in heavy small saucepan. Remove from heat, cover, and let steep 15 minutes. 3. Meanwhile, lightly butter 1 1/2-quart gratin dish or other shallow baking dish. 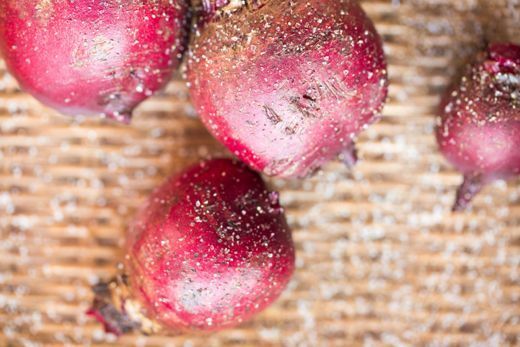 Arrange sliced beets in even layers in dish, sprinkling each layer lightly with salt. 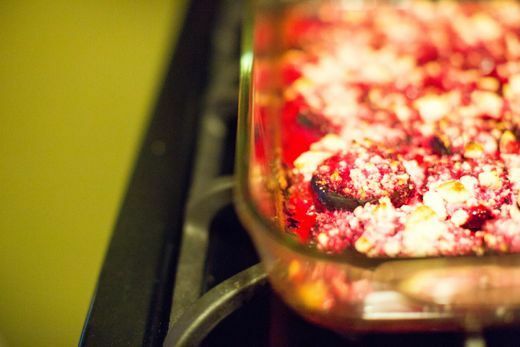 4.Strain cream mixture over beets in dish. Sprinkle feta over. Bake until cream is bubbling at edges and feta is browned in spots, about 20 minutes. Sprinkle pepper and chopped mint over. Let stand 5 minutes before serving. Serves 4.